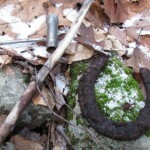 With a perfect day weather-wise, I decided to borrow a friend’s metal detector and investigate a couple suspicious spots along Havice Valley Road in Price Gap. One dated from about a year ago, another from just last week. 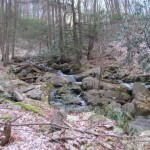 Both were close by Havice Spring, shown on most topo maps. 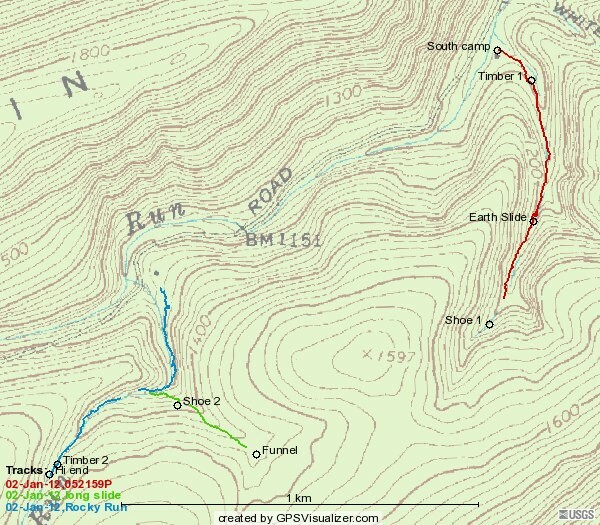 On the east side of Havice Valley Rd in Price Gap, there is a ledge that looks a lot like RoW, and which curves to the south and east around the corner of the mountain. 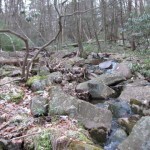 On the west side of HVR, there is another ledge, built of substantial rocks at the bottom near the stream, which climbs steadily up the mountain to the south and west of the gap. 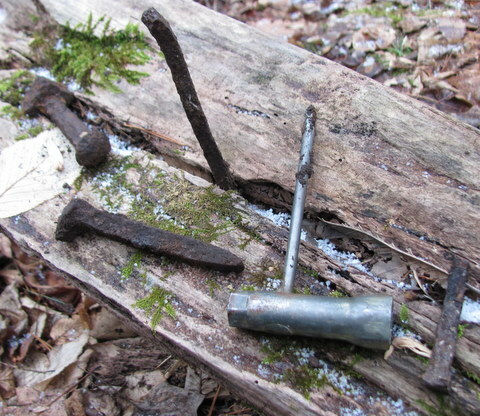 Despite the promising appearances, the metal detector seemed to deny there was railroading involved. 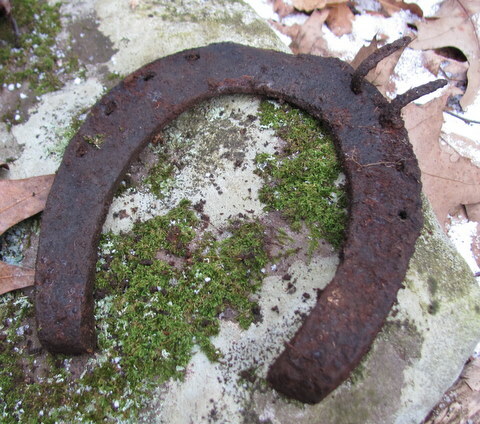 I found metallic junk, but no “good iron”. I regretfully have to place these two leads on the Unlikely list. Refusing to be discouraged, I continued east on HVR to the junction with Little Poe and Strong Mountain roads and took SMR to the south. 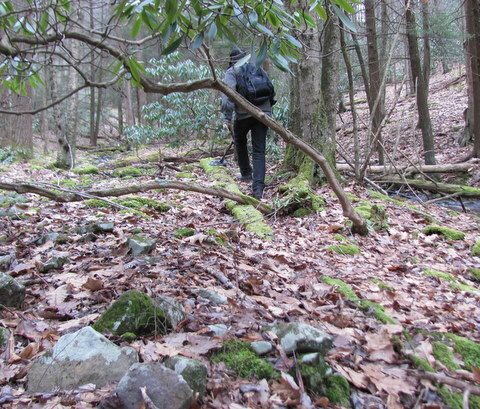 This is a fairly rough road (a “drivable trail” in DCNR parlance) and requires good ground clearance, if not 4wd. It provides an impressive view of Price Kettle and taste of the north end of Kish Valley. I reached the flat just short of Flat Hollow Rd and parked near the vernal ponds on either side of the road. Based on Kline’s info and our earlier survey, it seemed Duncan’s railroad should have reached this point. 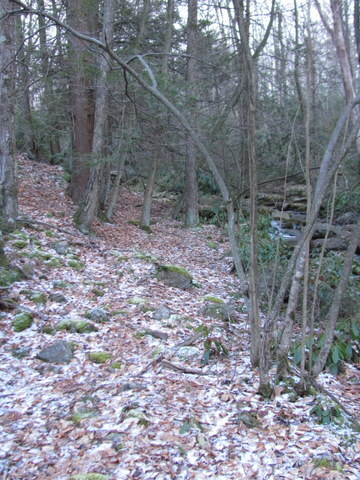 I first crashed around in Mtn Laurel near the junction with FHR and found nothing except Mtn Laurel. I then followed my original plan, heading ENE on the trail that crosses SMR at the ponds (40.79509,-77.44543). 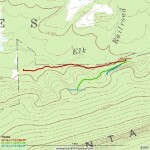 My original goal was the point about 1/2 mile E where the trail diverges 90 degrees. It seemed logical to look beyond the bend. However about 1/4 mile out I noticed fairly clear rocky areas to my right and decided to have a lookabout. I didn’t immediately notice any good grade, but I did see a very large pine tree. Following my theory about large pine trees, I examined its base and poked about with the metal detector to see if it was on the RoW. It wasn’t. A short distance away, however, the detector sounded a fairly loud alarm. 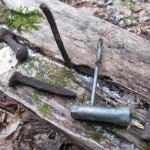 I quickly dug up a broken four-bolt joint bar. Hum. I don’t think this is a natural formation! I soon turned up a track bolt which allowed me to get the bearing of the RoW, which I surveyed a distance to the east before the brush became too thick. 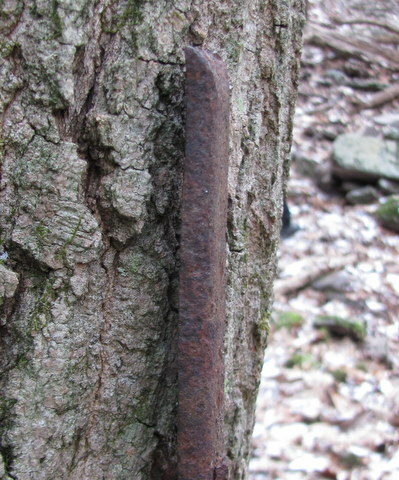 Why a second joint bar on what Kline says was a wood-railed gravity tramroad? Returning to the big pine tree, I surveyed a distance to the west until I reached a pine thicket which exceeded my determination. I suspended the track and cut back over to open trail. 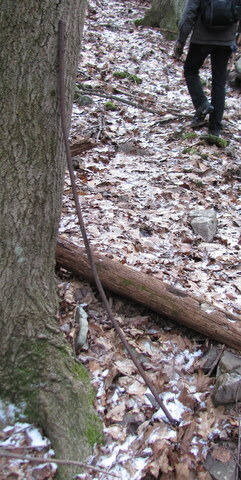 Naturally I was right on a branch of it that I had previously explored; that always seems to happen! On the way back to SMR I tried to check a spot or two on the RoW, but the swampiness and thickets atop the flat are pretty discouraging. I decided to try the west side of SMR. 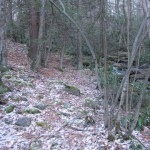 I walked west on Flat Hollow Rd, trying to avoid Mtn Laurel. I first checked on the south side of the road due to something I’d seen on aerial views and found nothing. I then tried the north side of the road where it seemed RoW should be. In a fairly rocky area, I found a very large pine tree. Examining its base with the detector, I found exactly nothing. Not far away, the detector alerted me to metal (are you having deja vu yet?) and I pulled out an encrusted spike. Squinting, I figured I sort of had the bearing of the RoW and began to record a track. 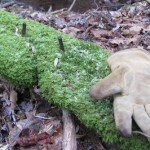 After a while the track entered a thicket and swampy area and became vague. 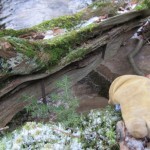 I expected to find some timbers in the dampness, but no luck. 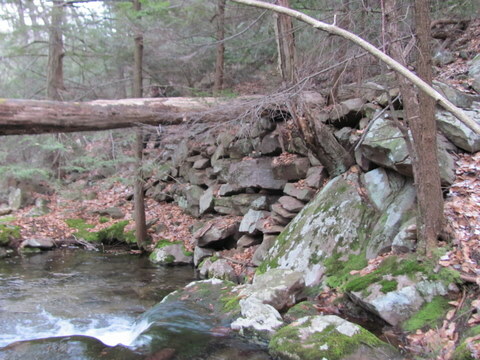 Crossing the associated small stream, I couldn’t pick up the RoW again. 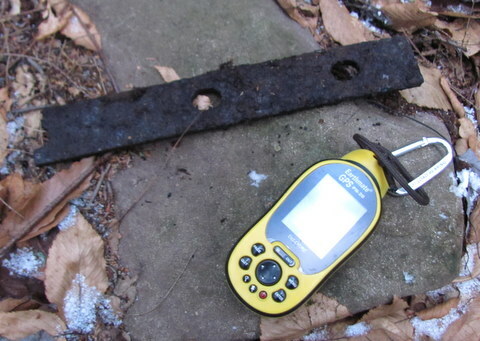 Using the detector, I located a signal and pulled out an interesting fragment of a chain link. 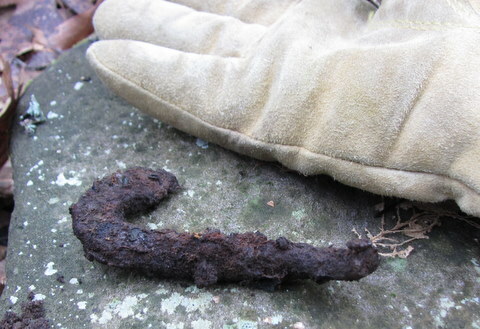 Knocking off the thick corrosion, its fibrous nature is very obvious… the link was clearly hammered from wrought iron by some long deceased blacksmith. 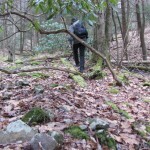 I decided that was enough excitement for one day and began a long slog back to the truck through very thick Mtn Laurel. I decided to exit via Flat Hollow Rd, which was a good choice. 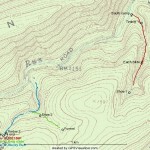 Approaching McNitt Gap, the valley narrows considerably, limiting where the RoW could be. I stopped for a quick check (about 40.78785,-77.46058) and saw probable RoW plunging to the stream just alongside the road. 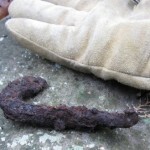 The detector showed something substantial there, but my limited energy didn’t allow me to determine exactly what it was. Suffice to say it seems very likely that Duncan came all the way to McNitt Gap, if not actually into the gap, which agrees with Kline’s map from Book #2 page 217. With a few hours to kill, we decided to brave the blustery weather and try to wrap up our survey along Little Shingletown Rd from 2008/04/06. 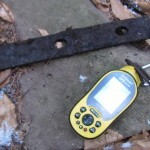 With the help of the GPS, we returned to our previous stopping point and resumed surveying. The route was pretty clear although sometimes disrupted by a water crossing. We found good tie depressions in many areas. Although the ground got steeper and steeper, the builders did not give up for an impressively long time. It actually seems they surmounted one of the steepest areas, although approaching the saddle at the top of the valley it probably gets way steeper. Near the end, the RoW encounters what appears to be a skid road at right angles. Shortly thereafter, the RoW seems to wind down and devolve into a couple of diverging log slides. One goes off to the east on relatively level ground, and one climbs steeply up the face of the ridge to the north. That seems to have been a loading point and the end of line. 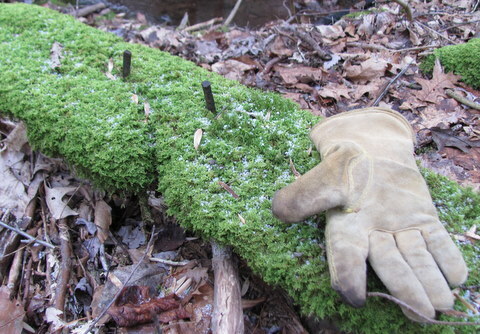 We added 0.49 miles to our previous survey, and are happy to cross this branch off our list. 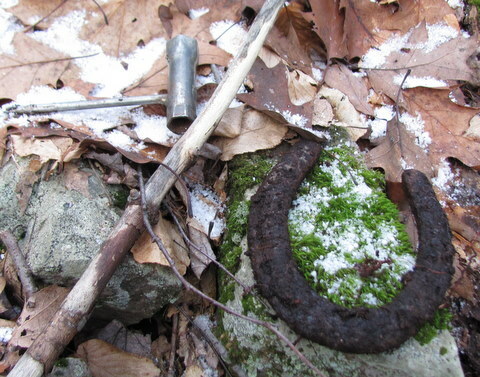 If you’re interested in exploring history in remote areas of Pennsylvania, you should be concerned about the current push to legalize Sunday hunting in Pennsylvania. If passed, it would mean that people like us who like to explore are at substantial risk of death due to injuries inflicted by careless hunters. We feel that it is only fair that non-hunters have one day of the week that we can safely move about the woods. Many hunters I have personally spoken to agree, and believe the Sunday hunting is primarily aimed at drawing more out of state hunters. The argument has largely been put in financial terms: the state believes they can make nearly a billion extra dollars by opening Sunday hunting. First of all, that seems highly unlikely. Second of all, fixing the state budget woes by endangering the few citizens who get off their fat asses and do something seems absurd and unfair. The Pennsylvania Farm Bureau is OPPOSING the Sunday hunting bill. Please check out their website for details. You can also visit the Pennsylvania General Assembly Website to contact state legislators. PLEASE take a minute to send an email or call your representatives and VOICE YOUR OPPOSITION TO SUNDAY HUNTING. Explore safely! Explore without Sunday hunting! With leaves falling from the trees and snakes and bugs becoming less of a problem, it seemed like a good idea to spend a sunny Sunday afternoon near Livonia. I headed out Rt 192 and stopped at MacNeal Orchards to get some direction on where to find more right of way. Based on their input, I headed south on Stover Gap Rd a short distance until a shale bank was visible on the west side. Parking there, I headed behind (west of) the shale bank, picking up some logging roads, and angled towards Elk Creek. Before long I was at the base of the hill approaching the stream. It seemed like there was sort of a grade, but it wasn’t very distinct. Continuing west along the base of the hill, I crossed a stream and suddenly I was on pretty distinct grade. I started a GPS track and headed west. Very soon I encountered ledges leading up the hillside to the south, but I decided to continue on the bottom track for a while and explore the ledges on the way back. The grade continued pretty clearly for about 3/4 of mile, then it got a bit vague. I left the GPS and explored ahead, but was a bit concerned I might not find it again. Plus I wanted time to head up those exciting ledges! I halted the track and headed back for my starting point. 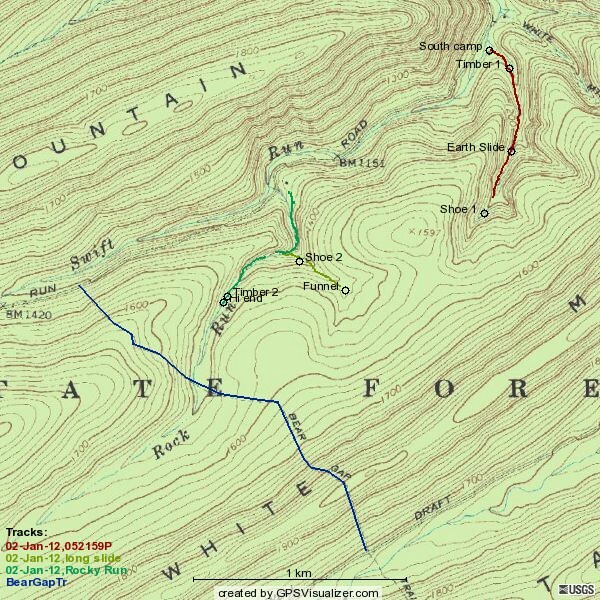 Based on discussions with the MacNeals, it seems this route continues at least as far west as Wohlford Run and the associated gap, so there is plenty of this level route left to survey on a future visit. Back at my starting point, I examined my options. A very short stub starts up the hillside and stops after perhaps 150 feet. This appears to be either a false start of a route up the hill, or perhaps a loading ramp location. This is marked on the maps as waypoint “Switchcrap”. I started climbing the next ledge up the hillside. It rose quickly, making me question how much I’d like to pilot a 20 ton locomotive down this hill after a rainy summer and fall like we’ve had here this year. 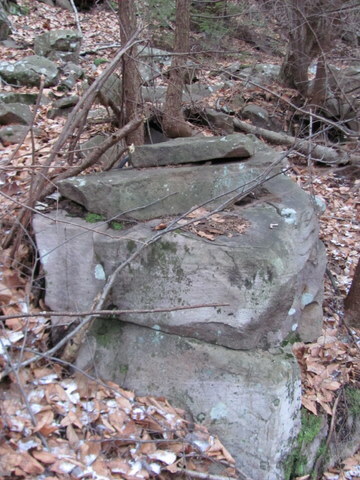 At the top of the steep climb, it swung to the south with a nice rock fill… no question what this was built for. It then climbed into a bit of a hollow with clear tie depressions in places. Eventually the RoW intersected a dirt road which I am told is gated where it comes off Stover Gap Rd. I poked around a bit and felt the RoW probably continued nearby, but it wasn’t immediately obvious where. I suspended the GPS track and headed back with about 1/4 mile surveyed. Back at Grand Central Station, I started a new GPS track on the uppermost ledge. This one was disconnected from the others, which seemed odd as it seems the most likely route down from ‘The Haystack’ (see previous post). 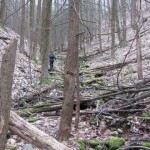 One possibility is that this was the original route Laurelton Lumber Co. took down to Elk Creek and the Walker Tract, but that it was later abandoned (as work progressed west) in favor of the ledge described above, which might be a bit less steep. Regardless, this ledge also continued up steeply, curved to the south, entered a fair cut through a shale bank, and was rudely interrupted by a sort of road/clearing on the edge of a clear cut area. On the other side of the clearing it appeared the route probably continued, but the thick layer of spice bush made proceeding unattractive. 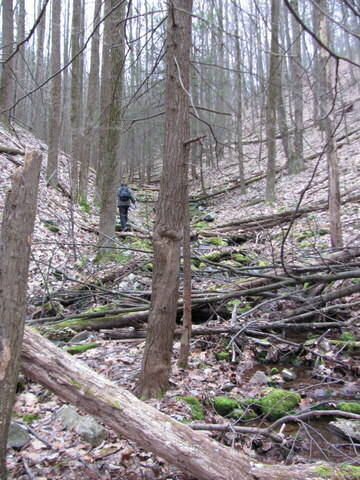 Nevertheless, the direction seemed correct to cross the deer exclusion zone and hook up with previously surveyed grade descending from ‘The Haystack’. Looking back at the GPS tracks now, I like my theory of the upper ledge being an early route which was replaced by a gentler slope. If you figure both routes climb the same elevation, my proposed later route takes 2-3 times as much length to do it, hence the grade would be substantially less. 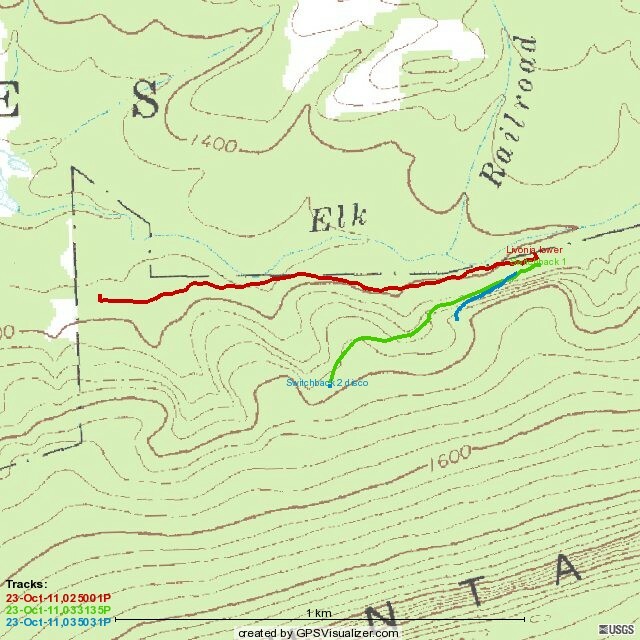 While the original route might have gotten them started, as they expanded cutting to the west in the Walker Tract it might have been too much of an operational hazard and too difficult to climb with loads. Note that the areas involved here were part of the ‘Walker Tract’ which Ben Kline’s book describe as “southeast of Livonia”. These were supposedly the last areas cut by Laurelton Lumber and were purchased “in the late 1890s”. The Laurelton sawmill was probably almost 20 miles from here by rail, and crews were probably quite glad when the Walker Tract was exhausted. According to Rails to Penn State, the Oreland branch of the Bellefonte Central RR was built to haul iron ore from Oreland bank on ‘Whipple farm’ to Bellefonte’s iron furnaces. 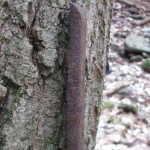 The branch was removed about 1892, when its rails and ties were lifted to build a 1 mile branch into the town of State College. The college was finally growing into something substantial, and the railroad foresaw more potential for traffic in the borough than it did in a modest ore bank. Here is an approximate map I of the branch I created by overlaying Penn Pilot aerial photos from 1938 with modern map data. It’s a pain! But I think I have the route down pretty well. The location of Oreland bank is shown; it’s now Lion’s Gate apartments, more or less. I have also marked the location of a stone quarry mentioned in the book, which was apparently where Hamilton Square shopping center is now. In the image below, it appears as a depression at the top right. If you know the area, it’s a bit bizarre to visualize an early 4-6-0 steam locomotive moving ore and stone through what’s now shopping centers, apartment complexes, and a high school complex. If you’d like to experiment with an interactive map of the branch, download this gpx file and upload it to GPSVisualizer.com. You can then view several aerial photo formats, as well as google maps, topos, etc. You can also combine this track with others for the Pine Grove Mills branch, etc. 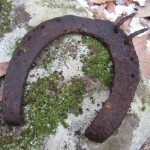 The domain LostRailroads.com has now been registered as a direct way to get to this site. 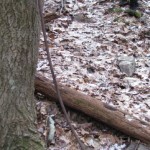 Hopefully it will be easier for you to remember, and more accurately reflect some of the investigations we do, which often extend beyond the logging railroads of central Pennsylvania and the State College region. Thanks for visiting! 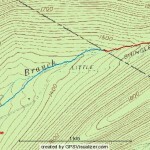 For some years I have wondered about the short-lived Pine Grove Mills branch of the Bellefonte Central Railroad, mainly because I used to drive across it several times a day. Some parts of its route are evident, some were less clear. Where exactly did it run? And where was the station? I’m currently reading Rails to Penn State by Mike Bezilla and Jack Rudnicki, and I’m back exploring the branch. Unfortunately, recent renovations at PGM school have paved over the site which Bezilla confirms was the station, and I’m fairly certain the foundation was bulldozed out before the paving. To play with a “live” map of the branch, download this .gpx file (it is a just a text file, nothing evil) and upload it at GPSVisualizer.com. You will get a live map which you can pan, zoom, switch between various views, e.g. 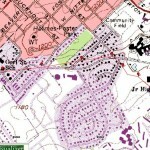 Google hybrid, USGS topo, etc. If you like GPSVisualizer, please send them a couple bucks! I’ve shown the approximate locations of the related stations and the Struble ore bank. 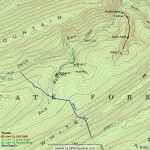 You may also wish to upload .gpx tracks for the Oreland and Gatesburg branches (see other postings), thus creating an interactive map of the whole region. 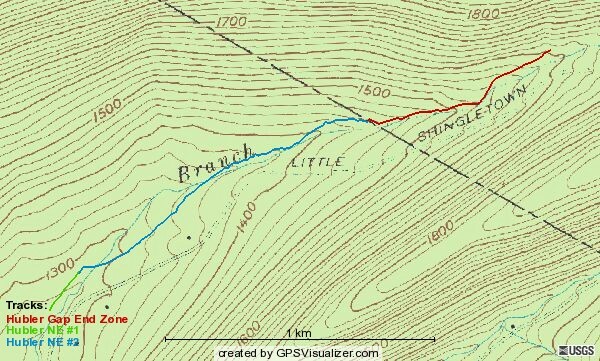 With a long holiday weekend, we decided to do some long overdue surveying in Green’s Valley (aka Cox’s Valley), northeast of the Laurel Creek reservoir. This was railroad built by Reichley Brothers to connect their operations with tramroad Gotshall had constructed southwest from Poe Paddy, through Panther Hollow and past Dinkey Springs. It must have been built shortly after 1900, after they acquired the Monroe Kulp mill at Milroy and associated railroads and chose to abandon the original Reichley tramroad from Poe Paddy along Poe Creek. We originally surveyed some RoW in these areas in late 2007, but had never filled in the gaps. We started by leaving a vehicle at the blocked bridge on Stillhouse Hollow Rd, off of Sand Mountain Rd, near Seven Mountains Scout Camp. We then drove to Siglerville-Millheim Pike and entered the “drivable trail” portion of the Mid State Trail in the Big Flat area. We knew that RoW was visible at the extreme southwest end of the drivable portion, so we began surveying there. Virtually all of the RoW in this region is now the Mid State Trail/Green’s Valley Trail. Normally, we wouldn’t be thrilled to have heavily used trail on top of a historic RoW. In this case, it’s a good thing, as it would be quite difficult to trace a lot of this route if hikers hadn’t kept it open and visible! There are exceptions, however. Every now and then you come to a stretch which is nicely built up and quite plainly railroad. 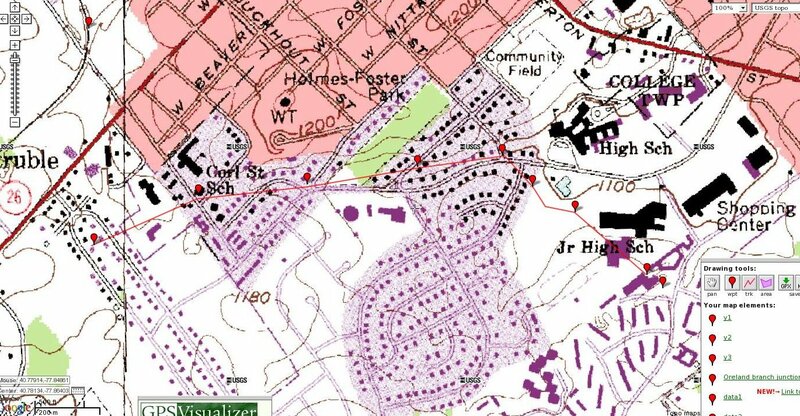 These sections are visible as a thin, light line on USGS aerial photos (visit GPSVisualizer.com). 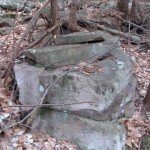 At one point, a large quantity of large rocks were pushed aside during railroad construction. 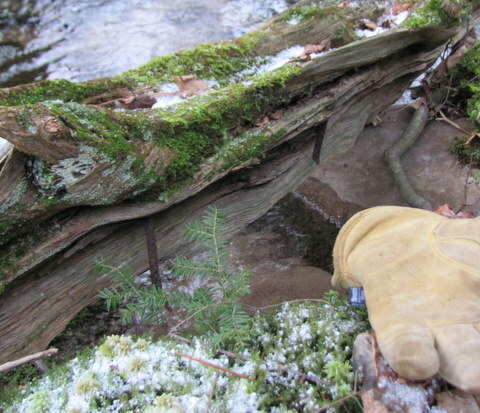 Previous visitors have collected clinkers and placed them in a pile atop the rocks, as clear evidence of what once went on here. 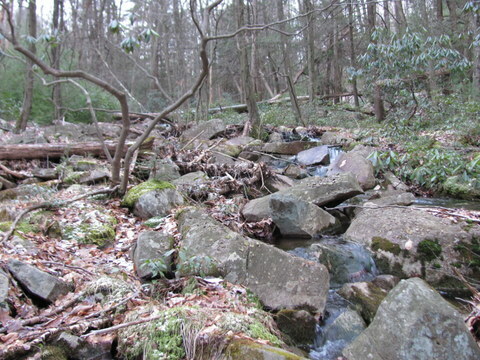 We completed our survey at the intersection with Stillhouse Hollow Rd, with 3.01 miles recorded. Incidentally, the bridge here has finally been redecked, and it’s possible you can now drive to here from the Milroy end, assuming the gate on that end is open. 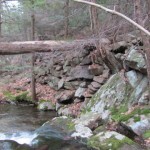 Note that Stillhouse Hollow Rd is still blocked with large rocks on the Sand Mountain Rd end. 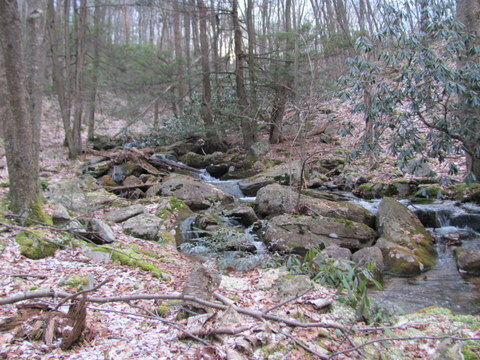 The only portion of this route we still have to fill in some day is from the switch to the southwest of here down into Laurel Creek reservoir. This area is extremely overgrown, so we will probably leave it until much later.